A Christmas Elf holding a heart and wishing you: Merry Xmas! 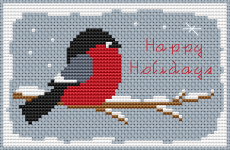 A red Santa hat helps to make a cool Christmas xstitch-card.Quick and easy design for everyone,from beginners to advanced stitchers. 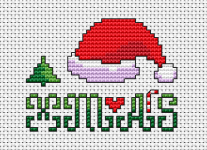 14 count Christmas Green Aida.Text:NOEL.Smyrna cross stitch technique. 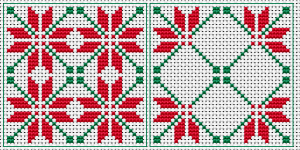 An idea for a Christmas bookmark stitched on green fabric and based on so called Smyrna stitch technique. A group of cute little cardinals birds. The red cardinal holds a special spiritual meaning for Christians. 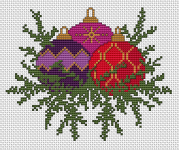 Beautiful Holidays themed pattern of three Christmas decorations for your crafts projects. 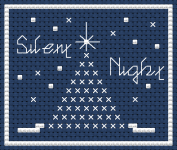 Christmas themed pattern of a tree with candles and the text:Merry Christmas.